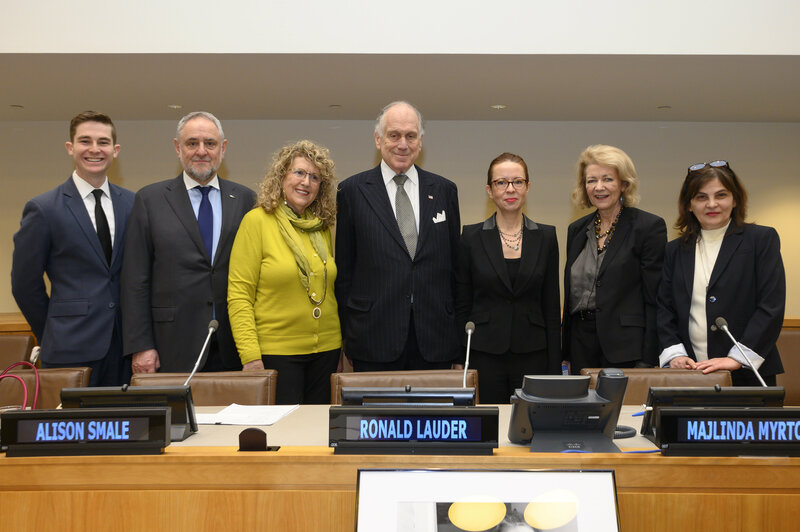 NEW YORK – The World Jewish Congress, the Permanent Mission of the Republic of Albania to the United Nations, and the UN’s Department of Global Communications hosted a special briefing at the UN headquarters in New York on Thursday, as part of International Holocaust Remembrance Day Commemorations, recalling Albania’s moral courage in rescuing the Jews of its country during World War II. The briefing was moderated by Alison Smale, United Nations Under-Secretary-General for Global Communications, and featured poignant speeches by WJC President Ronald S. Lauder, Permanent Representative of the Republic of Albania Besiana Kadare, and WJC CEO and Executive Vice President Robert Singer, among others. WJC President Lauder said in his address: “When almost every country in Europe appeased the Nazis, gave in to the Nazis, and even helped the Nazis, Albania was the only country occupied by the Axis where the Jewish population was larger after the war than before it started… Human decency is part of it, but courage is a major component, and so is leadership. Most people don’t act alone, they follow the dictates of their leaders. Today, 74 years after the war, we are seeing the resurgence of antisemitism again. And once again there is a real leadership vacuum in our world today, and that is very dangerous... Leading up to World War II, the world was indifferent to the plight of the Jews in Europe and look what happened. Today, we see the same indifference once again. When it is now politically acceptable for candidates to run on an anti-Israel and antisemitic platform, and have no political leaders call them out on it. That is indifference. That is silence. And that is not acceptable." “Given this stark history, how do we deal with the rise in antisemitism in 2019? The way to fight it is with leadership. How do we prevent future attacks on Jews and all other minority groups? How do we control this age-old evil? We teach our children what happened in the past. We lead by example. We show our children our own courage by fighting this hatred now and not by pretending it’s not there or showing indifference. This hatred will never go away. Our children will, no doubt have the same fight on their hands, years from now. The only way to deal with it, the only way to survive, is to fight it. Do not be indifferent. Do not be silent. If our political leaders won’t lead in this fight, we have to,” Lauder added. “Today, we witness populism, xenophobia, Neo-Nazism and hate groups on the rise, fueling anti-Semitism and other forms of hatred around the world. Civil society plays an important role in documenting hate speech and hate crimes. These findings are critical if we are to know how to address the hatred effectively, challenge its root causes and build communities that are resilient, compassionate and just,” she added. “Holocaust education and remembrance has an important role in stemming the rise of prejudice and hate. Understanding the significance of historic actions taken to defend human rights – such as in Albania – is the first step towards encouraging such positive behavior among people today," Smale added. The panel discussion also featured remarks by Majlinda Myrto, the Executive Director of Eye Contact Foundation, David Estrin, founder of the Together We Remember youth organization, and Anna Kohen, a Holocaust survivor whose family was among those rescued by the Albanians. Distinguished guests included Congressman Eliot Engel, who is also Chairman of the International Council on Foreign Relations operating under the auspices of the WJC, Israel Consul General in NY Ambassador Dani Dayan, Acting US Ambassador to the UN Jonathan Cohen, and Imam Dr. Tahir Kukiqi of the Albanian Islamic Cultural Center of Staten Island. This briefing was one of eight events being organized by the United Nations Holocaust Programme to mark the International Day of Commemoration in memory of the victims of the Holocaust, and one in a series of briefings organized weekly by the United Nations Department of Global Communications Civil Society Unit.